What does it take to paint a patriotic/Christian image that, when displayed and discussed in a YouTube.com video, draws 3 million hits and 2,500 comments? Well, it takes faith, apparently. If any additional evidence were necessary to establish the reality that the political winds in America have shifted markedly, even troublingly, in the span of just a few short years, that evidence could well be derived from the experiences of a fine artist by the name of Jon McNaughton. If McNaughton’s story is any indication, some of our most cherished national beliefs are now regarded by millions as distortions and falsifications. As for the mixed bag of being successful and sniped-at — more in a moment. For now, a different, though related, thought. As I sit lounging on our living room sectional, laptop atop my lap, tapping out the opening lines of this article, we have the television playing and the set is tuned to a History Channel program. It’s the first of six episodes of a 12-hour extravaganza called America: The Story of Us. (If you want to jump ahead to the promised coverage of McNaughton and avoid this disgression on a television show, click here.) Why say anything about our evening’s entertainment fare? Because it suddenly strikes me that this televised exercise in historical revisionism bears some relation to the biases and prejudices faced by our Mr. McNaughton. Having done my research on McNaughton, and thus being aware of the scorn heaped on him from some quarters, I made sure I caught the opening episode of this series, because a question was already forming in my mind. Would the makers of this series even so much as mention Christianity? After all, America was founded by Christians. I didn’t need Jon McNaughton to tell me that. 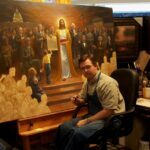 But McNaughton’s brush with hostile, vocal nonbelievers made me wonder if filmmakers today would even give so much as a nod to Christianity as having a part in the formation of our country. The terms “religion” and “faith” are broad-brush terms, sufficiently PC to be a catchall for any brand of “spirituality.” Is just any kind of spirituality sufficient for explaining the formation of the United States? Here’s how the History Channel describes its series: “History takes a six-week look at how determination, hard work, and ingenuity made America.” Or, alternatively, “how self-determination and innovation made America.” So, still, I am wondering: was the “making of America” so purely secular? For more on the program—including a link to the History Channel’s site—go here. And yes, the show does (otherwise) have many merits. 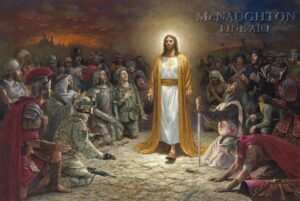 Comes now Mr. McNaughton, and his painting, which has drawn the praise (or ire) of millions. What strikes this writer as remarkable about his story is not the fact that his painting drew angry responses. It was the fact that McNaughton has gotten so much flak for a message that, a few decades ago, would have hardly raised an eyebrow—at least from the standpoint of being objectionable. But we live in a world where, increasingly, the sacred is treated as profane, and the profane is treated as sacred. McNaughton’s case is just one example of a change that is affecting all of our society. His typical subject matter is material that used to be deemed conventional, heartlandish, Middle American, even ultra-traditional. When did the traditional become radical? 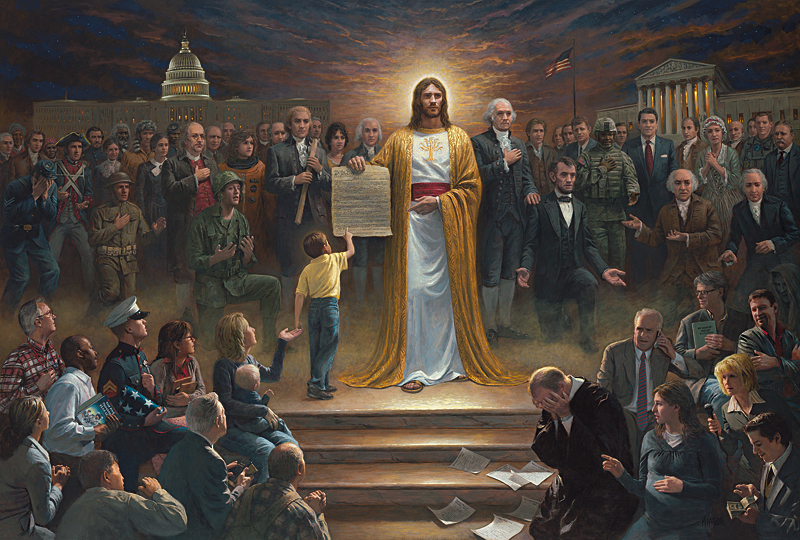 McNaughton’s supposedly “controversial” image portrays Jesus Christ holding a copy of the Constitution of the United States. Christ is surrounded by an array of figures both historical and symbolic. McNaughton’s unmistakable statement is that Christianity and the Bible were the wellspring that furnished the ideals of the Constitution. He finished the painting in June 2009. For a few months it merely occupied space in his gallery. Then, in October, the artist and some of his associates created a video, accompanied with music and narration, telling the story of the creation of the artwork, and they posted the clip on YouTube.com. It went viral. Not all were favorable. In fact, a sizable amount of the feedback was hostile. “There are some people out there who just hate what this painting stands for,” the artist says. 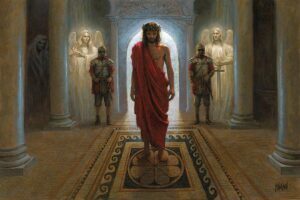 Much of the criticism directed at McNaughton’s image has come from viewers who decided, at little more than a glance, that this individual or that individual in the scene was not actually a Christian. Not that the backlash hasn’t been strong. But it was only a matter of a few weeks before the situation flip-flopped, said McNaughton, 42. It was then that the sympathetic, favorable responses started trickling in, then pouring in. And even some of the angry individuals were disposed to listen to McNaughton’s defense of his work. Dallan Wright, print production manager for FOV Editions, has worked with McNaughton for a number of years. He calls McNaughton a “family man” who “is very open and enjoyable to work with.” Wright says McNaughton is always professional, kind, and patient, possessing an even temperament. The upshot of all the furor, Wright says, is that “sales went through the roof.” And for all the people who have been dismayed by the painting, there have been more who are inspired by it, he says. Wright’s employer, which maintains a website at foveditions.com, handles such artists as Simon Winegar, Greg Olsen, Jim Norton (of the Cowboy Artists of America), and other notables. Sagebrush recently sold 50,000 reproductions of a single image—a nativity scene—by McNaughton. “Jon recently burst onto the scene with a painting that one of my associates and he worked on together,” Singleton says. “Jason Bullard worked with Jon on Peace is Coming, which marked a turning point in Jon’s career. McNaughton said the idea struck him as none ever had before. “I actually got the idea during the 2008 presidential campaign,” he says. “I had just found out that [U.S.] Senator [John] McCain was going to be the [Republican] nominee. I was really frustrated. I was sitting in my gallery, and I said a silent prayer to myself. I said, ‘God, what can I do? I am just an artist.’ In what was a powerful experience, I looked at my easel, and I saw in my easel this painting fully completed—saw it for about ten seconds. “I sketched [from memory] as much of it as I could, and I used that as my guide as I prepared for the [actual] painting. It took about six months to paint it. 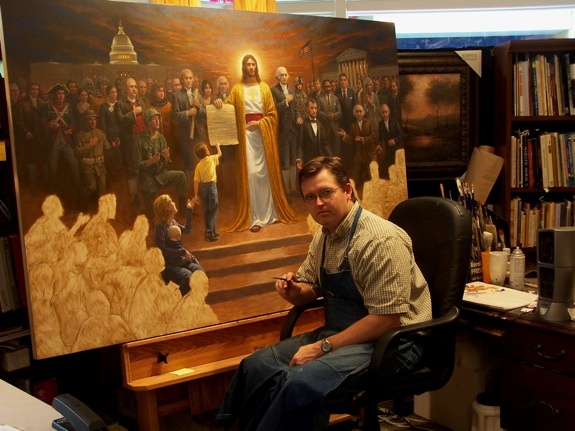 The image is about more than just the idea that Christianity inspired the Constitution, McNaughton says. There are figures in the foreground and in the background. The background figures—depictions of individuals in the past—are separated from the foreground figures—which represent contemporary individuals or types—by a line of dust that seems to rise from the ground, separating the two groups. The figures in the background appear to be reaching out to, or imploring, the figures in the foreground, urging them to uphold the principles of the Constitution. McNaughton says it is easy to tell, when someone approaches the image, which side they identify with. That’s the side that initially draws their vision. Describing himself as—not surprisingly—a conservative, McNaughton says that he experienced pressure, during his academic career, to abandon his traditionalist/realist leanings and paint abstract forms. But he resisted that pressure, he says, and went his own way. Much of his art education was, accordingly, self-administered. He “spent time in museums” studying the technique and style of the Old Masters, for one thing. He fell in love with the French Barbizon school of Impressionism, and with the work of Jean Baptiste Camille Corot in particular. But ultimately he fashioned a style of his own. His early work was mainly landscape subjects. Now that he has switched more to the human form, the detail work has become more demanding and time-consuming for him. Some have suggested to him that he didn’t leave enough room for people to interpret matters for themselves. “But I didn’t want to leave material for interpretation,” he says emphatically. And is it hard to see why? Like the Constitution itself, some truths ought to be held as self-evident. For more on this topic (specifically, my defense of McNaughton ideals against someone else’s published challenge to him), go here. To go to this site’s main (home) page, click here. To return to the menu page for the e-newsletter (Something Solid, Issue 2), click here.